This, and all MCS auctions are operated according to the auction rules of the Machine Cancel Society. Downloads include Machine Cancel Society Auction, Closed October 30, 2018 (PDF), Machine Cancel Society Auction, Closed October 30, 2018 (EPUB), Machine Cancel Society Auction, Closed October 30, 2018 (AZW3), Machine Cancel Society Auction, Closed October 30, 2018 (ODT), Machine Cancel Society Auction, Closed October 30, 2018 (Web Page), Partial List of Images of Lots for Machine Cancel Society Auction Closed October 30, 2018. Downloads include Machine Cancel Society Auction, Closed June 26, 2018 (PDF), Machine Cancel Society Auction, Closed June 26, 2018 (EPUB), Machine Cancel Society Auction, Closed June 26, 2018 (MOBI), Machine Cancel Society Auction, Closed June 26, 2018 (ODT), Machine Cancel Society Auction, Closed June 26, 2018 (Web Page), Partial List of Images of Lots for Machine Cancel Society Auction Closed June 26, 2018. Downloads include Machine Cancel Society Auction, Closed February 6, 2018 (PDF), Machine Cancel Society Auction, Closed February 6, 2018 (EPUB), Machine Cancel Society Auction, Closed February 6, 2018 (MOBI), Machine Cancel Society Auction, Closed February 6, 2018 (ODT), Machine Cancel Society Auction, Closed February 6, 2018 (Web Page), Partial List of Images of Lots for Machine Cancel Society Auction Closed February 6, 2018. Downloads include Machine Cancel Society Auction, Closed August 29, 2017 (PDF), Machine Cancel Society Auction, Closed August 29, 2017 (EPUB), Machine Cancel Society Auction, Closed August 29, 2017 (MOBI), Machine Cancel Society Auction, Closed August 29, 2017 (ODT), Machine Cancel Society Auction, Closed August 29, 2017 (Web Page), Partial List of Images of Lots for Machine Cancel Society Auction Closed August 29, 2017. Downloads include Machine Cancel Society Auction, Closed May 18, 2017 (PDF), Machine Cancel Society Auction, Closed May 18, 2017 (EPUB), Machine Cancel Society Auction, Closed May 18, 2017 (MOBI), Machine Cancel Society Auction, Closed May 18, 2017 (ODT), Machine Cancel Society Auction, Closed May 18, 2017 (Web Page), Partial List of Images of Lots for Machine Cancel Society Auction Closed May 18, 2017. Downloads include Machine Cancel Society Auction, Closed February 21, 2017 (PDF), Machine Cancel Society Auction, Closed February 21, 2017 (EPUB), Machine Cancel Society Auction, Closed February 21, 2017 (MOBI), Machine Cancel Society Auction, Closed February 21, 2017 (ODT), Machine Cancel Society Auction, Closed February 21, 2017 (Web Page), Partial List of Images of Lots for Machine Cancel Society Auction Closed February 21, 2017. Downloads include Machine Cancel Society Auction, Closed November 29, 2016 (PDF), Machine Cancel Society Auction, Closed November 29, 2016 (EPUB), Machine Cancel Society Auction, Closed November 29, 2016 (MOBI), Machine Cancel Society Auction, Closed November 29, 2016 (ODT), Machine Cancel Society Auction, Closed November 29, 2016 (Web Page), Partial List of Images of Lots for Machine Cancel Society Auction Closed November 29, 2016. Downloads include Machine Cancel Society Auction, Closed May 24, 2016 (PDF), Machine Cancel Society Auction, Closed May 24, 2016 (EPUB), Machine Cancel Society Auction, Closed May 24, 2016 (MOBI), Machine Cancel Society Auction, Closed May 24, 2016 (ODT), Machine Cancel Society Auction, Closed May 24, 2016 (Web Page), Partial List of Images of Lots for Machine Cancel Society Auction Closed May 24, 2016. Downloads include Machine Cancel Society Auction, Closed February 16, 2016 (PDF), Machine Cancel Society Auction, Closed February 16, 2016 (EPUB), Machine Cancel Society Auction, Closed February 16, 2016 (MOBI), Machine Cancel Society Auction, Closed February 16, 2016 (ODT), Machine Cancel Society Auction, Closed February 16, 2016 (Web Page), Partial List of Images of Lots for Machine Cancel Society Auction Closed February 16, 2016. Downloads include Machine Cancel Society Auction, Closed November 17, 2015 (PDF), Machine Cancel Society Auction, Closed November 17, 2015 (EPUB), Machine Cancel Society Auction, Closed November 17, 2015 (MOBI), Machine Cancel Society Auction, Closed November 17, 2015 (ODT), Machine Cancel Society Auction, Closed November 17, 2015 (Web Page), Partial List of Images of Lots for Machine Cancel Society Auction Closed November 17, 2015. Downloads include Machine Cancel Society Auction, Closed August 25, 2015 (PDF), Machine Cancel Society Auction, Closed August 25, 2015 (EPUB), Machine Cancel Society Auction, Closed August 25, 2015 (MOBI), Machine Cancel Society Auction, Closed August 25, 2015 (ODT), Machine Cancel Society Auction, Closed August 25, 2015 (Web Page), Partial List of Images of Lots for Machine Cancel Society Auction Closed August 25, 2015. Downloads include Machine Cancel Society Auction, Closed May 19, 2015 (PDF), Machine Cancel Society Auction, Closed May 19, 2015 (EPUB), Machine Cancel Society Auction, Closed May 19, 2015 (MOBI), Machine Cancel Society Auction, Closed May 19, 2015 (ODT), Machine Cancel Society Auction, Closed May 19, 2015 (Web Page), Partial List of Images of Lots for Machine Cancel Society Auction Closed May 19, 2015. Downloads include Machine Cancel Society Auction, Closed February 17, 2015 (PDF), Machine Cancel Society Auction, Closed February 17, 2015 (EPUB), Machine Cancel Society Auction, Closed February 17, 2015 (MOBI), Machine Cancel Society Auction, Closed February 17, 2015 (ODT), Machine Cancel Society Auction, Closed February 17, 2015 (Web Page), Partial List of Images of Lots for Machine Cancel Society Auction Closed February 17, 2015. Download include: Machine Cancel Society Auction, Closed November 18, 2014 (PDF), Machine Cancel Society Auction, Closed November 18, 2014 (EPUB), Machine Cancel Society Auction, Closed November 18, 2014 (MOBI), Machine Cancel Society Auction, Closed November 18, 2014 (ODT), Machine Cancel Society Auction, Closed November 18, 2014 (Web Page), Machine Cancel Society Auction Closed November 18, 2014 (some lot images). The estate of the late Frederick Langford has sold all remaining copies of Mr. Langford's books to the Society for resale to members. 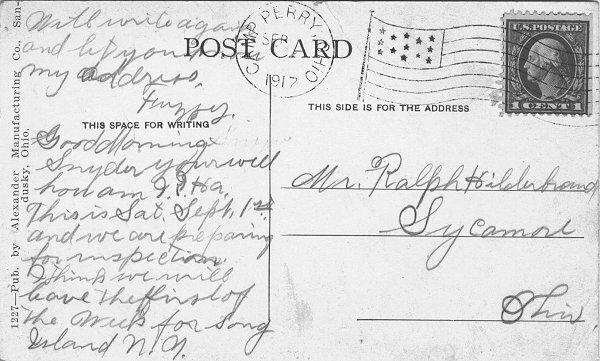 It cannot be emphasized enough that Mr. Langford was the authority on American flag machine cancels. See the Machine Cancel Society Publication List for more information on ordering these books. Downloads include: Machine Cancel Society Auction, Closed May 20, 2014 (PDF), Machine Cancel Society Auction, Closed May 20, 2014 (EPUB), Machine Cancel Society Auction, Closed May 20, 2014 (MOBI), Machine Cancel Society Auction, Closed May 20, 2014 (ODT), Machine Cancel Society Auction, Closed May 20, 2014 (Web Page), Machine Cancel Society Auction Closed May 20, 2014 (some lot images). Downloads include: Machine Cancel Society Auction, Closed December 10, 2013 (PDF), Machine Cancel Society Auction, Closed December 10, 2013 (EPUB), Machine Cancel Society Auction, Closed December 10, 2013 (MOBI), Machine Cancel Society Auction, Closed December 10, 2013 (ODT), Machine Cancel Society Auction, Closed December 10, 2013 (Web Page), for Machine Cancel Society Auction Closed December 10, 2013 (some lot images). This auction included exhibit groups from the Boy Scout collection of the late Reg Morris. Downloads include: Machine Cancel Society Auction, Closed August 27, 2013 (PDF). Machine Cancel Society Auction, Closed August 27, 2013 (EPUB). Machine Cancel Society Auction, Closed August, 2013 (MOBI). Machine Cancel Society Auction, Closed August 27, 2013 (ODT). 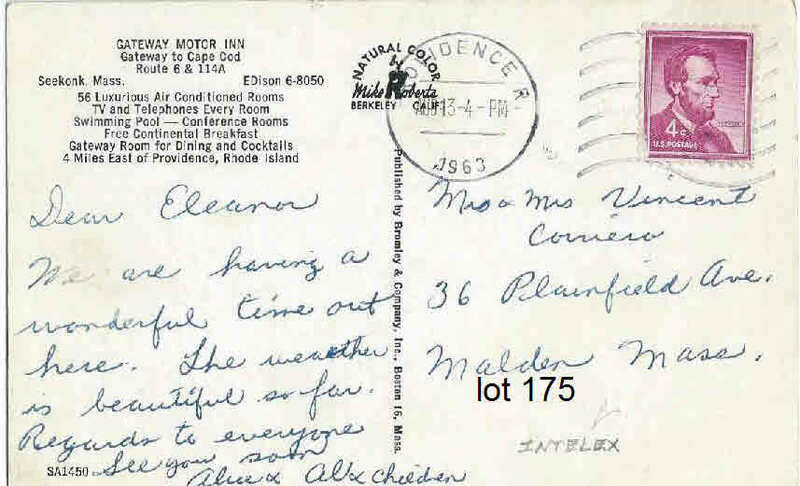 Machine Cancel Society Auction, Closed August 27, 2013 (Web Page). Society Auction, Closed August 27, 2013 (Some Lot Images). 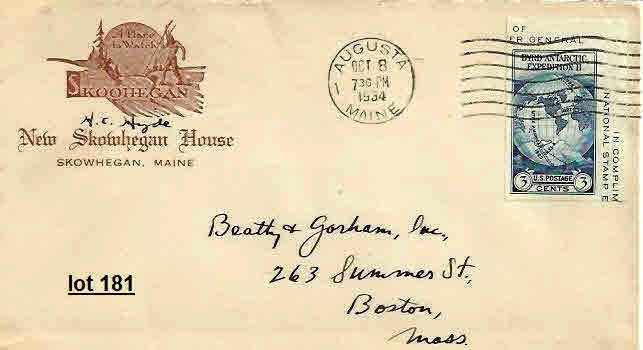 This auction included literature items from the estate of the late Reg Morris. Downloads include: Machine Cancel Society Auction, Closed May 21, 2013 (PDF). Machine Cancel Society Auction, Closed May 21, 2013 (EPUB). Machine Cancel Society Auction, Closed May 21, 2013 (MOBI). Machine Cancel Society Auction, Closed May 21, 2013 (ODT). 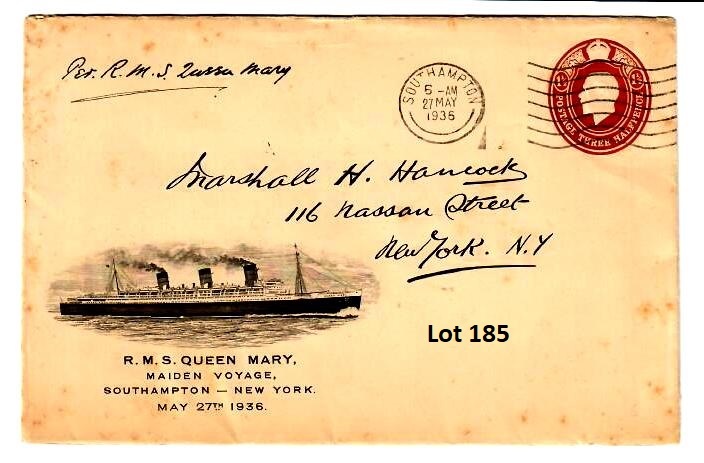 Machine Cancel Society Auction, Closed May 21, 2013 (Web Page). 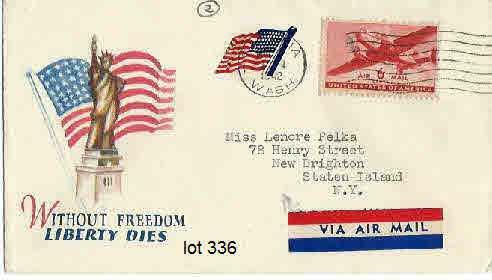 Society Auction, Closed May 21, 2013 (Some Lot Images). 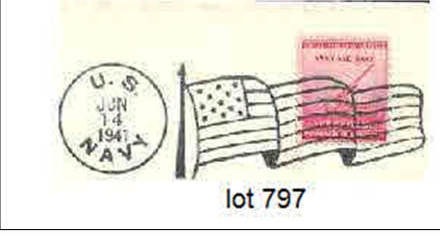 This auction featured many new high point value flag cancels from Fred Langford that did not sell when they were first offered in Jim Mehrer's auctions. It also had several machine cancels that are not frequently seen, such as Cheshire, Constantine, Evans and a Whitehead. Be sure to check the items near the end of the list, because they include literature items from the estate of the late Reg Morris. Downloads include: Machine Cancel Society Auction, Closed November 20, 2012 (PDF). Machine Cancel Society Auction, Closed November 20, 2012 (EPUB). Machine Cancel Society Auction, Closed November 20, 2012 (MOBI). Machine Cancel Society Auction, Closed November 20, 2012 (Web). 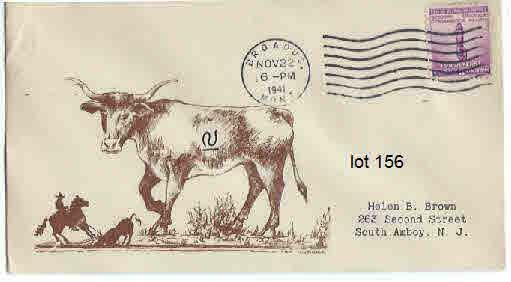 Machine Cancel Society Auction Ended November 20, 2012 (Selected Lot Images). This auction offered high-point flags from the estate of the late Frederick Langford, along with 50 Columbia and 50 Doremus cancels, and many other items. Downloads include: Machine Cancel Society Auction, Closed August 21, 2012 (PDF). Machine Cancel Society Auction, Closed August 21, 2012 (EPUB). Machine Cancel Society Auction, Closed August 21, 2012 (MOBI). Machine Cancel Society Auction, Closed August 21, 2012 (Web). Machine Cancel Society Auction Ended August 21, 2012 (Selected Lot Images). This Society auction closed May 24, 2012. 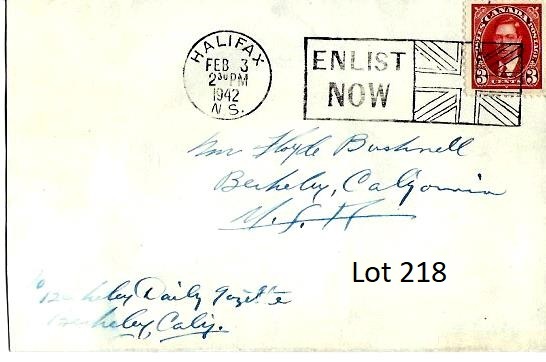 This auction offered material from the machine cancel collections of David Hewett and Frederick Langford, along with some machine cancels not often seen. In addition, the auction included an exhibit from Frank Shively of spray cancels. Downloads include: Machine Cancel Society Auction, Closed March, 2012 (PDF). Machine Cancel Society Auction, Closed March, 2012 (Web). Machine Cancel Society Auction, Closed March, 2012 (EPUB). Machine Cancel Society Auction, Closed March, 2012 (Kindle). Machine Cancel Society Auction, Closed March, 2012 (Selected Lot Images). This Society auction closed February 21, 2012. The auction offered material from the machine cancel collections of David Hewett, James Mason, along with some items from the late Frederick Langford's extensive collection. Downloads include: Machine Cancel Society Auction, Closed February, 2012 (PDF). Machine Cancel Society Auction, Closed February, 2012 (Web). Machine Cancel Society Auction, Closed February, 2012 (EPUB). Machine Cancel Society Auction, Closed February, 2012 (Kindle). Machine Cancel Society Auction, Closed February, 2012 (Lot Images). A number of items from the estate of the late Frederick Langford were sold by public auction. The Schuyler Rumsey auction house is based in San Francisco. See the website: Catalog of Schuyler Rumsey Auction, Taking Place January 24-27, 2012, for more information and to view the lots. In particular, check the lot numbers starting at 1056, and then later around 2600. 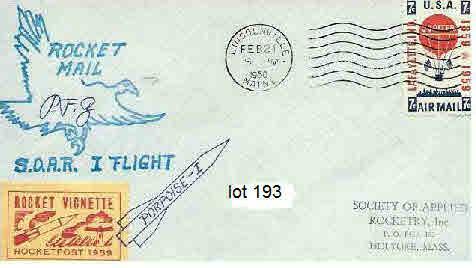 I have chosen to illustrate this web page with the image for lot #1075, an Eagle and Thunderbolt cancel on piece. Check the linked page for official Society announcements made in advance of calendar year 2011: Machine Cancel Society Announcements for 2011. 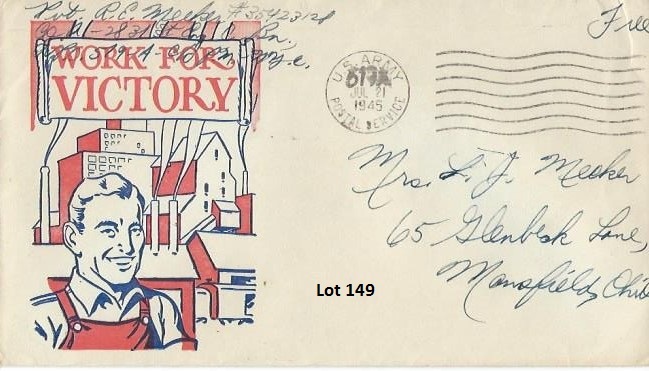 The Machine Cancel Society auction, which closed November 22, 2011, offered material from the machine cancel collections of David Hewett and James Mason, along with some items from Langford's extensive collection. You can still view the auction listings at: Machine Cancel Society Auction, Closed November 22, 2011 (PDF), Machine Cancel Society Auction, Closed November 22, 2011 (HTML), Machine Cancel Society Auction, Closing November 22, 2011 (EPUB), Machine Cancel Society Auction, Closing November 22, 2011 (MOBI). 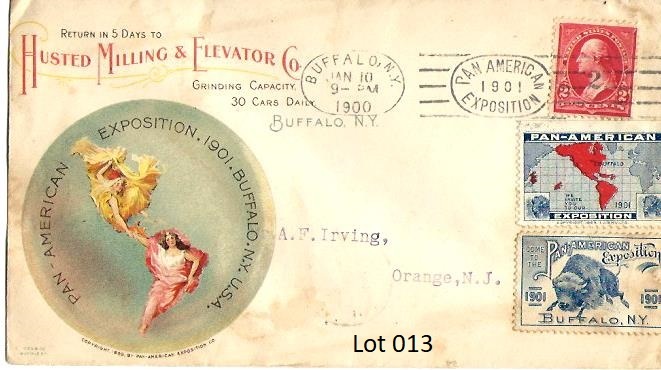 Lot images available at: List of Images of Lots for Machine Cancel Society Auction Ending 11/22/2011. The special auction for 2011, set up by our Auction Manager, Don Pearson, offered plenty of material for the machine cancel collector. 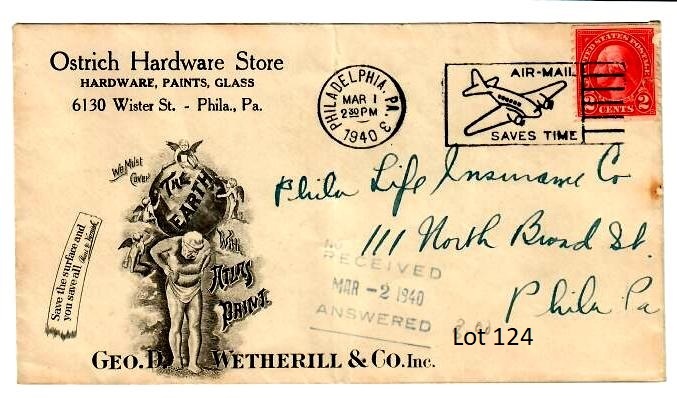 This auction closed August 23, 2011, but you may still view the listing. The Annual General Meeting of The Machine Cancel Society was held at Cleveland, Ohio, on Saturday, March 20, 2010, and was quite a success. Our intrepid editor created a special edition of The Machine Cancel Forum for this event, which is a fantastic document. Parts of the MCF are in color, something we cannot normally do for the general newsletter. The content is a fascinating study of "unknown" possible-machines used for cancelling mail. Take a look at this Special Edition Garfield-Perry Machine Cancel Forum. This PDF file has not been converted to the MOBI file for Kindle (tm), but we have created a special version of the PDF file that reads quite well on the Kindle (especially when viewed horizontally). Try: Special Edition Garfield-Perry Machine Cancel Forum ["narrow margin version", 8MB PDF file]. 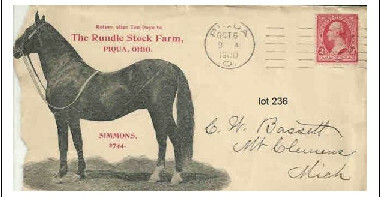 The APS StampShow, held in Pittsburgh in August 2009 was a great success. Many members and officers of the Machine Cancel Society attended the show, as well as the Annual Meeting. In addition, the Society ran a great information booth on the show floor. Our editor worked very hard, and created a special edition of the Machine Cancel Forum. Electronic copies of this special edition are available as PDF files, including: the entire Forum as a single PDF file [9 megabytes] and individual PDF files for each article in the special Forum edition [9 megabytes]. Also, this special edition of the Forum has been converted to the "MOBI" format, which is compatible with the Amazon Kindle (tm). Interested Kindle owners should try downloading the Special Edition 2009 Stampshow Machine Cancel Forum [16 megabyte .mobi file]. The December 2009 Special Issue of the Machine Cancel Forum has been mailed out on the Centennial of the Boy Scouts of America. It is dedicated to Reg Morris who was very involved in Scouting. In recent years, we have lost many founding members who were leaders of both our hobby and our Society. See an updated article on the subject of electronic documents and use of social media in the Machine Cancel Society. The Flag Cancel Encyclopedia was the life's work of Frederick Langford. The Third edition has been an absolute must have for machine cancel collectors for many years. Now, after decades of work, a new edition is available. The Machine Cancel Society is now the seller of these books, along with Langford's Doremus book. See MCS announcement of sales of last copies of Langford's books. for cancellation. It will be posted the next time the International HD2 is in use. You can also request that your covers be posted for September 11th and Veterans Day November 11th, as these mailing dates are already scheduled. 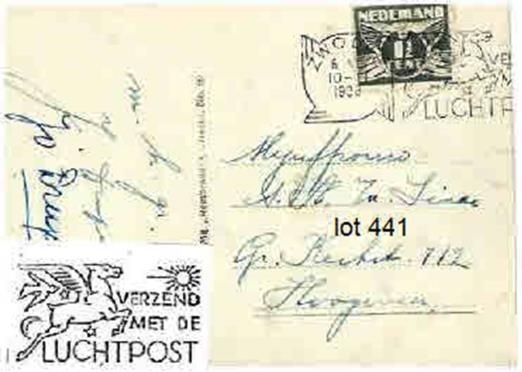 Your cards and envelopes need to be addressed, and will pass through the mails unprotected from sprays and other cancels, unless you supply a larger return envelope for philatelic return. There is no charge for this cancellation. It is the Warren community's pleasure to make this cancel available for public use. 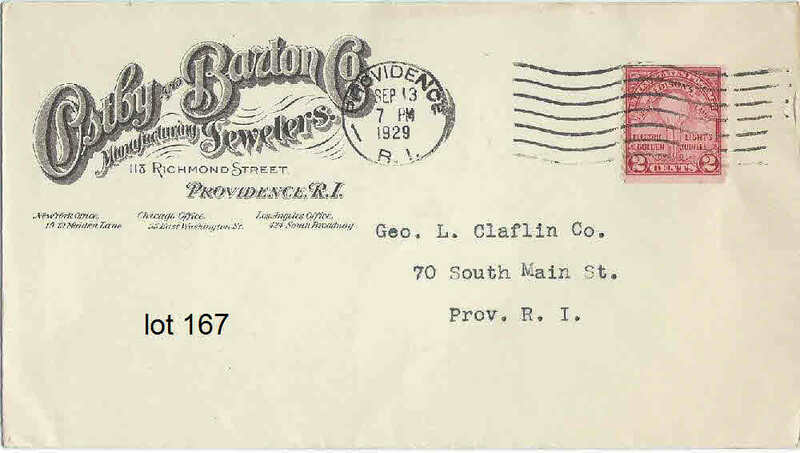 Our Society's Past President, William Barlow, Jr., has produced an award-winning exhibit (2008 Indypex GOLD) on the history of machine cancels used in Boston, Massachusetts. 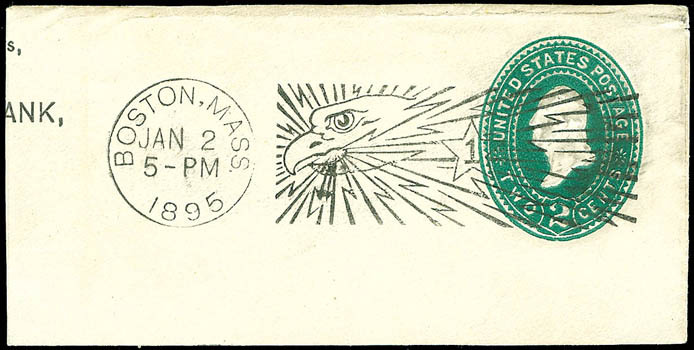 Most collectors of machine cancels will recognize that Boston was a major center for experimentation with new machines, and study of American flag machines used in this city alone offers an amazing variety. The exhibit goes well beyond the American company and is a useful education for both new and experienced machine cancel collectors. The Boston Machine Cancel Exhibit is now available online here at the MCS website. 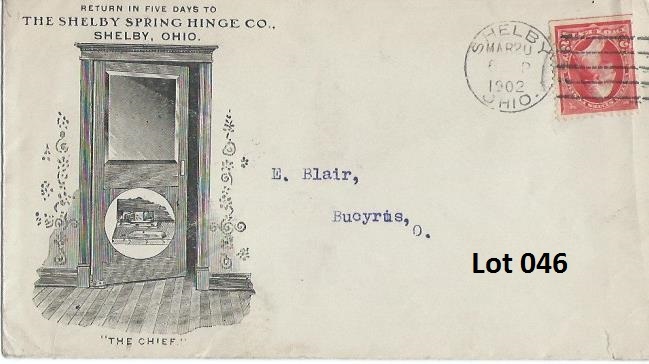 A new machine cancel publication: the Ohio Town List of Universal Machine Cancels is now available online here at the MCS website. The document was prepared for the first Universal Symposium held at the Trumbull Philatelic Exhibition in 2008. This publication was prepared for the educational use of Machine Cancel Society members and its guests at the Symposium and this web site. 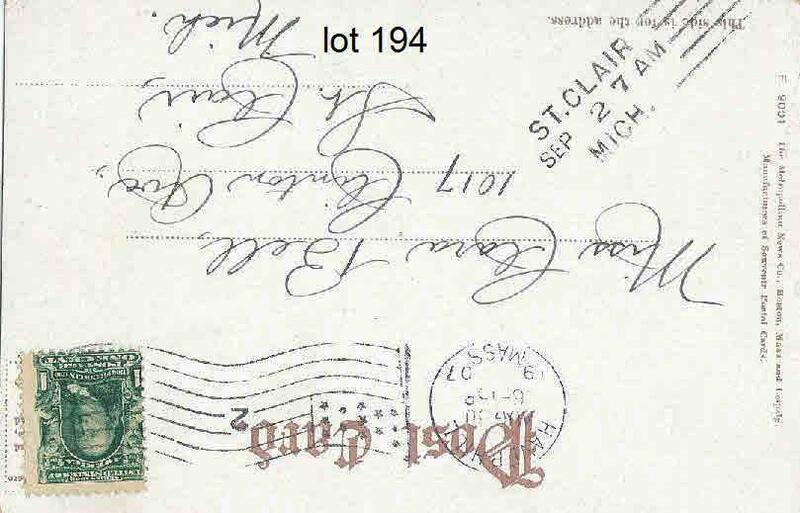 Use of this document is restricted, see the Ohio Townlist front material for the exact license wording. The new Miller book (Second Edition) From Hinrichsen to Krag is available in only limited quantities, as received at the Machine Cancel Society. We are selling them as a service at $58, postpaid USA. Shipping to Europe or Oceana will be an additional $15 postage. If you want the book shipped with your October Forum, send a $58 check to Gary Carlson and on the same day send an email to Alex Savakis mcsforum21IXioi9pppaawGHGH3OFSWS0@embarqmail27sawER57yiii4iIIXKBD24.com3lll3wWWEeUWPSZKJCUNVCIIF54 saying you paid for a book. This offer is only available to Society members. The "classic" triumvirate: Bart Billings, the late Bob Payne, and Reg Morris have completed a WW II Book of APOs, the result of over 10 years effort. Here is an article about the APO book, giving more details about its contents, and how you can order a copy. Your webmaster has come upon a possible EKU for the Camp Perry, Ohio American flag cancel. The primary reason for the "possible" is the poor quality of many of these cancels. 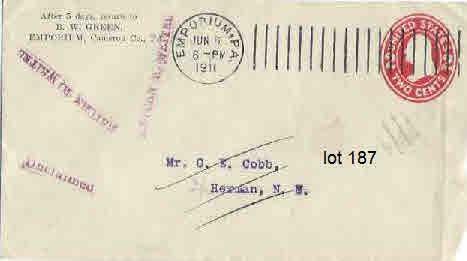 This one is missing the day, but the postcard message says that it is the first of September (1917) so that puts us pretty close. A scanned image is here.